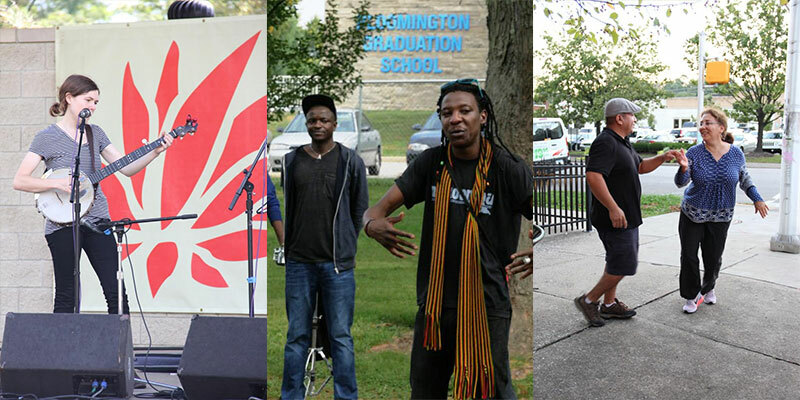 Produced by the non-profit Lotus Education & Arts Foundation, the Festival shares global worldviews, spotlights artistic insights, invites personal stories, and celebrates the power of art and community. For 23 years, the annual Festival has embodied and advanced the mission of the Lotus Education & Arts Foundation: to create opportunities to experience, celebrate, and explore the diversity of the world’s cultures, through music and the arts. Community support for the Festival is a cornerstone of its success and broad accessibility. Presenting Sponsors Indiana University and Blueline Media Productions led 70+ local businesses and organizations in underwriting $80,000+ of critical Festival expenses. Individual donors, patrons, and interest-based groups (such as Friends of Old Time & Celtic Music and several IU cultural organizations and schools) provided tremendous additional support. A full list of 2016 sponsors can be found here. After a very successful rollout in 2015, the second annual Food Truck Village served ~1,800 guests and drove over $19,000 in revenue to local small businesses. Guest chef curator David Tallent helped select vendors committed to diverse cuisines and local ingredient sourcing. Restaurants, hotels, and downtown businesses positively report about the economic benefit during the Festival weekend. 29 new ensembles made their Festival debut in 2016 adding Austria, Canary Islands, and Iceland to our artist map (120+ countries over 23 years). Within the 32 total ensembles featured during the weekend, Lotus was host to 148 individual artists from 24 different countries. 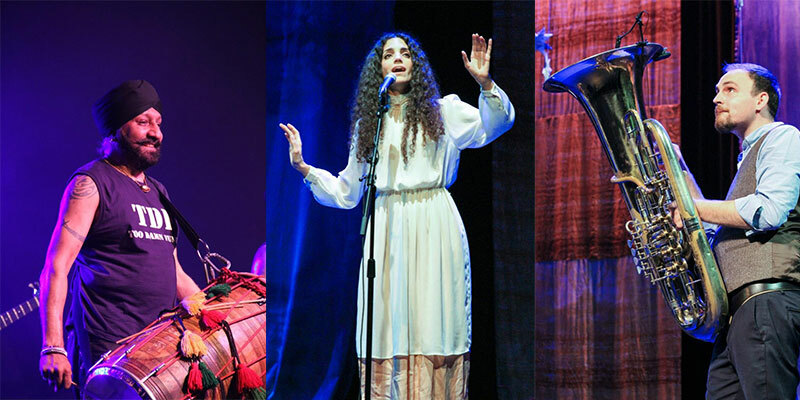 Fully one-third of the lineup featured groups led or co-led by women artists, and it was a particularly strong year for musicians representing African and Nordic nations. The full festival roster can be found here. Around the Body, Around the World, the featured Festival exhibit, explored global garment traditions ranging from the ceremonial to the everyday. The month-long exhibit housed in the Ivy Tech John Waldron Arts Center welcomed a record 2,100+ people to experience stunning textile displays and interact with collectors at gallery talks and receptions. 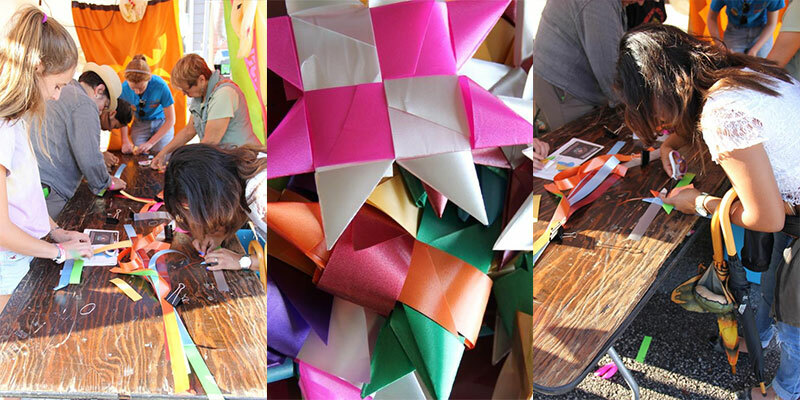 The Festival Arts Village provided ~1,400 people with 8 hours of free educational workshops, demonstrations, and activities, including “Rainworks” displays and the centerpiece “One Million Stars to End Violence” walk-through installation. Hands-on opportunities for children and young adults (and the young at heart) included Lotus Inflatables, chalk art, and hula hoopin’, while short performances featured The Limestone Brass Band (a “teenage-ish” brass band out of Bloomington) and Ritmos Latinos Indiana, a local group who dances, teaches, and performs rueda de casino, a form of salsa that originated in Cuba. One Million Stars to End Violence, “is an opportunity to remind each other that we CAN do something about it and not feel paralyzed by all that is broken with humanity,” said Maryann Pau, the initiative’s Australian-based founder who visited Bloomington during the Festival. Lotus is an official partner with One Million Stars, alongside 150 international communities working to collectively create 1M woven stars for a grand display during the Gold Coast 2018 Commonwealth Games. The Festival provided 2,500+ participants the opportunity to create and contribute over 3,000 pieces of art to this powerful worldwide advocacy effort against all forms of violence. Lotus in the Park is the cornerstone of our free Festival programing. This year, the Park featured 5 hours of free activities for 2,000+ people, with a special spotlight on the Indiana Bicentennial. Art Camp stations included instrument building, Siyazama coloring, an Indiana block-printing tapestry, and hand-tool limestone carving. Traditional Arts Indiana exhibits highlighted regional artisans, while three lively performances on the Mainstage celebrated the state’s musical heritage, including a showcase of Quinten “Lotus” Dickey’s original and traditional songs as well as a participatory community dance on the lawn. 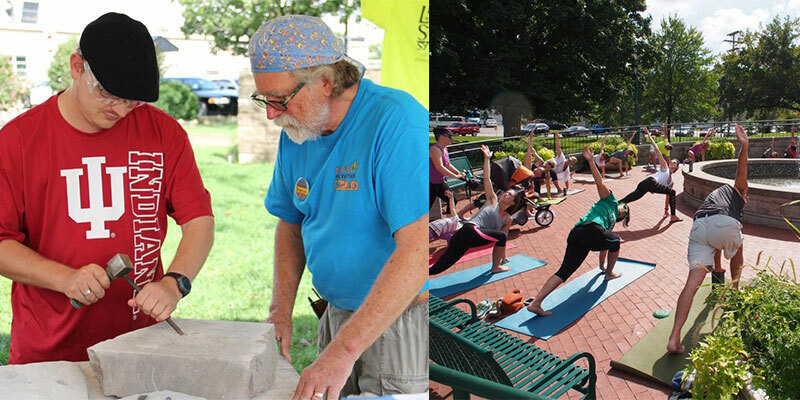 Lotus programs in the Park continued on Sunday with our first-ever “Festival Unwind: Yoga in the Park,” which drew 73 people over 3 all-levels sessions led by local yoga studios and teachers. For those desiring a deeper immersion into Lotus offerings, the Lotus Lineup Lowdown partnered with the IU Department of Folklore & Ethnomusicology to present a free preview of the Festival’s lineup focused on artists’ homelands and cultures. Indiana University campus outreach activities deepened student engagement with visiting artists through collaborations, discussions, jam sessions, and talks in the Jacobs School of Music, IU Polish Studies Center, IU Wells/Hutton Honors College, and the Mathers Museum of World Cultures. The Lotus Festival Student Orientation included 190+ high-school students and teachers from outside Monroe County who participated in learning the traditional Argentinian partner dance, the Tango, before experiencing the Festival’s evening activities. Thank you to all of our Lotus artists, donors, sponsors, volunteers, and attendees who came to together to create a truly special 2016 Festival! Your support is vital. Visit www.lotusfest.org for more information about Lotus programs throughout the year.